Wiki Ed staff Eryk Salvaggio, LiAnna Davis, and Samantha Erickson at the USF Art+Feminism Edit-a-thon. Photo by Shawn under CC-BY-NC 2.0. 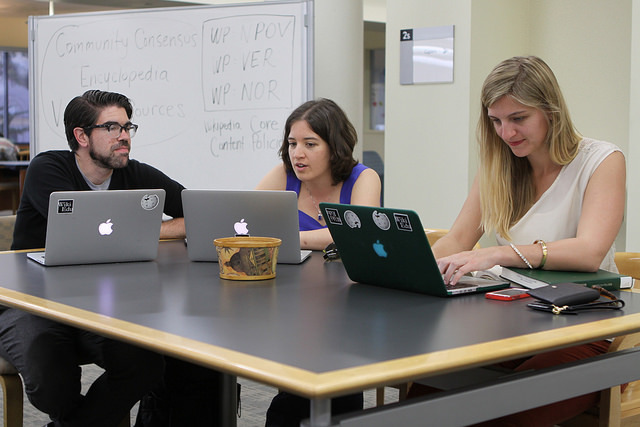 Four Wiki Ed staff attended the University of San Francisco library’s Art+Feminism edit-a-thon today during lunch, joining USF staff and students in creating and editing articles on women artists on Wikipedia that were missing or underdeveloped. The event was one of several happening this weekend all over the world to improve Wikipedia’s coverage of women in the arts, broadly construed. Photos from the event are available on Flickr (and hopefully Commons soon!). We encourage anyone interested in helping close Wikipedia’s content gaps related to women to join the events this weekend. It’s a great way to learn the basics of editing Wikipedia, help contribute to the body of knowledge about women artists, and meet other people interested in furthering free knowledge about women artists. See the Art+Feminism website for more information and a full list of events this weekend.